A few weeks ago, the Bean and I were at the art supply store looking for some materials for another project and I saw that they were having a sale on their canvases. It has been a long time since I have done any painting on canvas, so I just stopped to look. Their large pre-stretched canvases were only $14, which is a great price, so I bought one even though I wasn't sure what I would use it for. When I got it home the Bee asked me what it was and after explaining I asked her if she would want to paint it and she very excitedly told me yes. 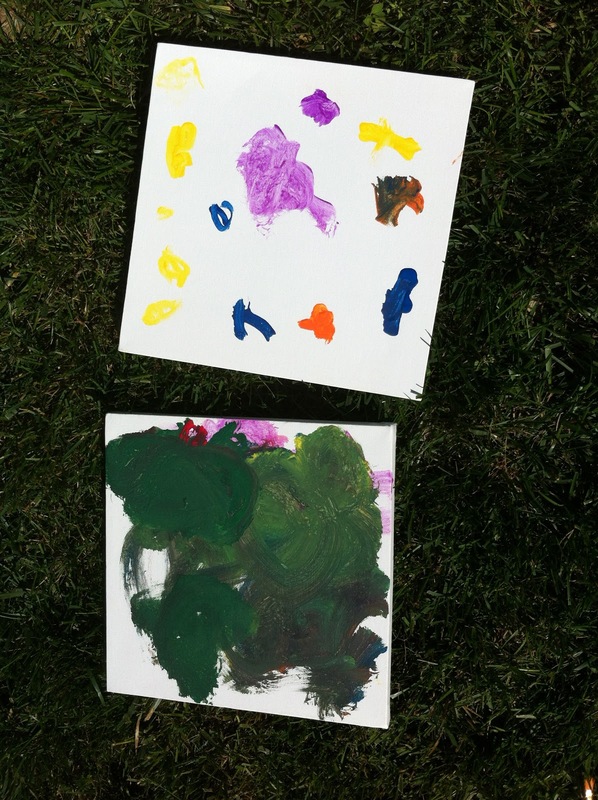 That Afternoon, while the Bean was napping, we went outside, with our large canvas, a container of acrylic paints (we have a bin of lots of different color bottles from the craft store), a plastic plate for a palate and lots of different paint brushes. After selecting her colors, and putting them on the plate I stood back and watched the her. Lately the Bee and I have been butting heads more and more often during our projects together. I don't think this is any weird phenomenon, she is almost 4, has a very clear idea of what she wants to do and knows exactly how she want to do it. As her mom, who shares her genes, I also have a very clear idea of what I want and know exactly how we should do it. You can probably see why the head butting happens there. So my main goal in this painting was to just stay out of it and let her make all the decisions. I did some weeding, secretly watching while she painted. 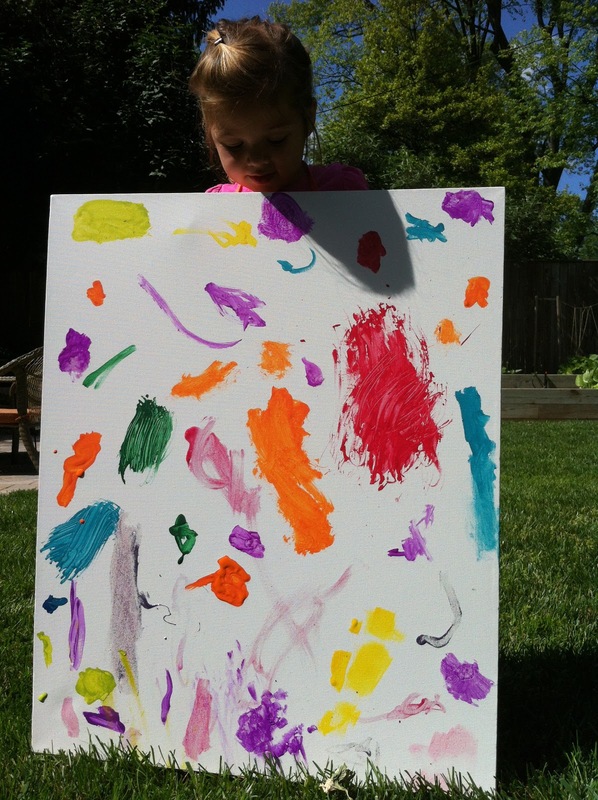 I loved watching her walk around the canvas and contemplate where each color should go. She made a very conscious decision not to overlap any colors and after a little while called me over to tell me she was done. She was very proud of her painting, which is now hanging in her room! After her nap the Bean came outside and I found two small square canvases we had and let her paint on one of those with the leftover paints. I should mention that acrylic paints are not always washable and can stain, so the Bean went shirtless and wore an old pair of pants that already had a hole in them. Her interest in painting was much more short lived then her sisters maybe 5 minutes or so. However the thing I found most fascinating was to see how differently she approached her painting. Where her sister was very methodical and cautious, the Bean just mixed up all the colors, used one brush and painted large circular strokes all over the canvas. Like her sister though, she was also very proud of her painting. The beautiful canvases are a good reminder to me that my kids are very different and that I need to remember that and let them do things the way that works best for them. These are really sweet. Thanks for illustrating how children really paint.